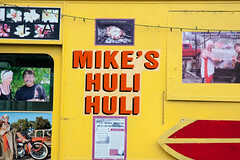 The hallmark of Mike’s is indeed the huli huli chicken. “Huli Huli Chicken” is basically a variation of teriyaki chicken, in which the chicken is marinated and glazed in a sauce that’s primarily pineapple and soy. The result, when done right, is basically barbecue chicken the way it should be: crispy, smoky, juicy, and tangy. And Mike’s does a particularly good job of it. Asking the staff, they claim it’s a combination of their special sauce and the wood, the latter being Kiawe wood: Hawaiian mesquite (that’s not a native plant, but has been there a long time). Sure enough, simply walking up to the food truck, the mesquite smoke is wafting over the parking lot, and by the time you order at the window, you are already hungry. 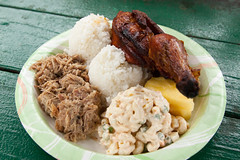 As far as the menu, most of the menu involves the famous Hawaiian “plate lunch” that traces back to an intersection between Hawaiian plantation culture and Japanese bento culture: two big scoops of rice, a similarly big scoop of macaroni salad (again, I really want to know more about the history here), and your meat. 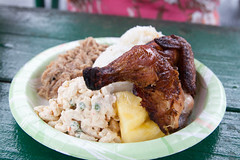 In our case, we opted for a combo plate with the huli huli chicken and kalua pig, and then sat down at one of the picnic tables. A few minutes later, they brought out our food. Let’s start with the chicken. I’ll be honest, I usually eschew anything resembling barbecued chicken, because it is so, so easy to use a grill to convert a perfectly delicious piece of chicken into a dry and unsavory result, as I’ve found at entirely too many restaurants (Peruvian chicken places are one of my few regular exceptions to this). But that’s not the case here at Mike’s: the resulting dark meat chicken quarter was basically the perfect expression of a grilled and glazed chicken breast. The meat itself was nicely cooked and very moist throughout, with a lot of mesquite smoke flavor permeating most of the meat. Add in some nicely crisped chicken skin covered with a tangy and somewhat spicy huli huli sauce, and the result is exactly what a good piece of grilled chicken should taste like. 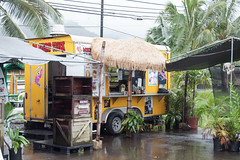 For this alone, I’ll be stopping at Mike’s the next time I find myself driving through Kaneohe. The kalua pig wasn’t too shabby, either, being a very flavorful and tender pork with a good helping of the same kiawe smoke, and a nice, rich pork flavor, served up as tender shreds. This wasn’t in the same league as the chicken, but was still quite good. The macaroni salad is worth mentioning as well. When we ordered the plate lunch, they asked us if we wanted traditional macaroni salad (and I noticed, there’s a noticeable uniformity amongst macaroni salad from different vendors in Hawaii: it’s a distinct variation that’s heavy on the dressing), or Mike’s house special macaroni salad. We opted for the latter, and it was a nice change-up, with a tangier sauce and a lot more veggies than the traditional macaroni salad. In any case, it worked well with both the rice and the huli huli chicken for a pleasant meal. So, overall, Mike’s was every bit as good as we had hoped, and some of the best grilled chicken I’ve had in the last year or so. Tangy, smoky, and moist, Mike obviously knows how to grill a chicken.